I think I’ve been successful in trying to curb my book buying urges as proven by my lack of In My Mailbox posts the past couple of weeks. I received a couple of free books this weekend and I wanted to make a post to share the titles as well as thank those who gave the books. The lovely Kristen of Fantasy Cafe was kind enough to send me an ARC of Eona by Alison Goodman when she found out that I’m interested in reading it as soon as I finish Eon. Thank you, Kristen, for sending it all the way to the Philippines! 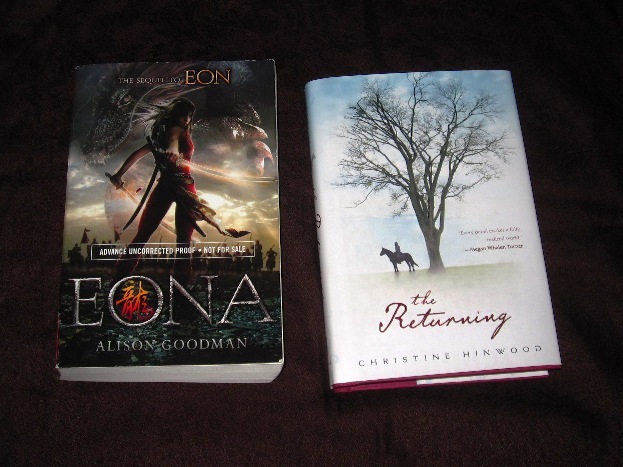 🙂 The Returning by Christine Hinwood is a book that I ordered from the Book Depository because it comes highly recommended by two of my favorite authors: Megan Whalen Turner and Melina Marchetta. I’ve seen lukewarm reviews but I’m still curious about it. Joyce and Roselle of Scholastic Philippines organized a dinner for book bloggers last Friday and as always, it’s nice to meet in person with other book bloggers to talk about bookish things. I met Ron, Leia and Meann for the first time. Other familiar faces there were Blooey, Tarie, Tina and Aaron. It was also the first time that I received actual review copies (not counting galleys) from a publisher and I’m so excited to read the books that I got. 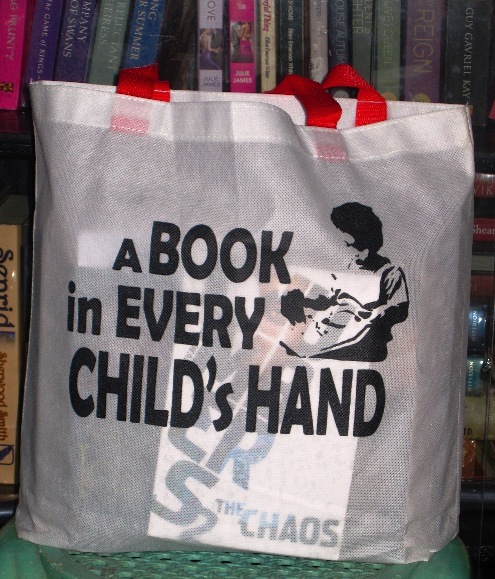 The bags were personalized and I think they based their choices on the kind of books that we read so thank you, Joyce and Roselle, for being so thoughtful! Tarie and I got Linger because we’ve already read Shiver while Tina got the two Wolves of Mercy Falls books. Aaron didn’t get any of the paranormal YA books because he isn’t interested in those while Blooey got Beauty Queens because she already has a copy of Linger. 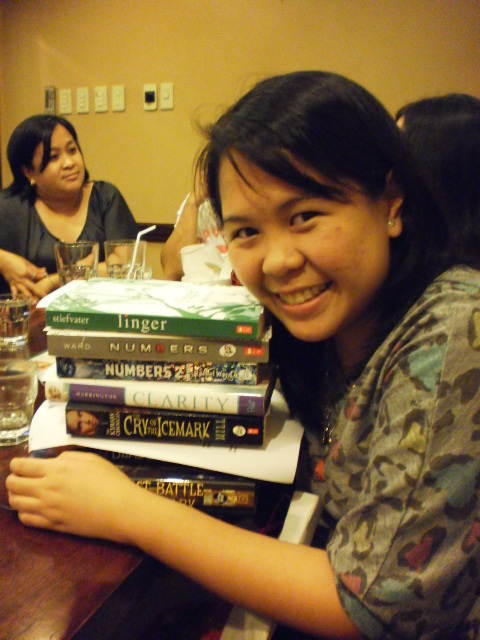 It makes me happy that publishers are now paying attention to local book bloggers. Let me know what you think of these books if you’ve read them already. What books did you get in your mailbox? See, you do get to read books before I do. 😛 They’re hefty books so I don’t think I can carry them around with me but I hope I can start on them soon. The reviews that I’ve seen have mostly been positive. Yep, it was fun to get free books! Even just the dinner would have been good enough. I appreciate that Scholastic Philippines is now reaching out to local bloggers. Hope you enjoy Eon and Eona! I can’t wait to see what you think of them! That sounds like a fun little get together and I am very impressed that they took the time to pay so close attention to all of your personal tastes. Enjoy your books! I think we all got the Icemark trilogy but I like that they didn’t give us books that we’ve already read. It means they visited our blogs and searched through our posts to know that kind of information. Wow, that’s awesome that Scholastic gave you all those review copies! I am a little jealous though I shouldn’t be since they are so hard to come by for international bloggers. Interested to hear what you think of Eona and The Returning. You really shouldn’t be jealous because this is the first time I’ve gotten review copies from a publisher (although I hope it won’t be the last) and I believe you get more review copies over there? 🙂 Besides, you have a lot of great books in your TBR pile now, like I’m jealous that you’re reading Saving June. I know, was so excited to get review copies! Joyce and Roselle of Scholastic were really nice and friendly. As always, I’m not sure when I’ll get around to reading the Hinwood book but I will definitely review it here. Oh so awesome that you went to a publisher event! And yay! For new books! 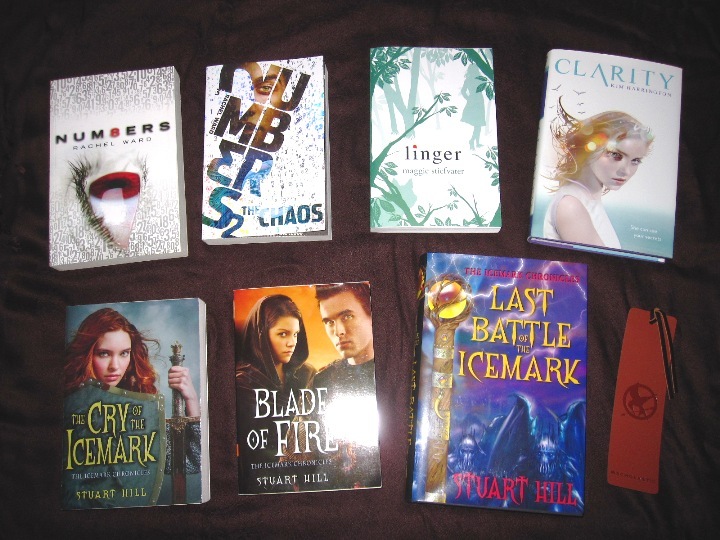 I have THE CRY OF THE ICEMARK sitting on my shelf but have never read it – you’ll have to post your review. And I have EONA too, can’t wait to finish this awesome series. So good. Ooooooh, nice! I remember being interviewed for Scholastic Philippines back when I was a fresh grad, but I think it was for a sales position and I was hunting for marketing jobs at the time. Wow, you could have worked for Scholastic back then! Both Joyce and Roselle are trade managers but I’m not sure if they’re department falls under marketing? So would it be safe to assume that you have the US hardcover of The Cry of the Icemark because of the cover? 😛 Just looked it up on Goodreads and it’s beautiful! I think I passed on Scholastic because I had a batchmate who was hired there and she resigned after a month because the sales positions where quota based (school market sales). Trade Managers could either be for trade marketing, trade sales, or a combination of both. It really depends on the structure of the company. Hmmm, maybe I should apply there again. Except Scholastic (in the Philippines) must be a relatively small operation, so I doubt that they’d have any marketing openings. Oops, accidentally erased parts of my message. The sentence before that was supposed to say if you would be ok with giving me any contact number for Scholastic. And no, I don’t own a copy of the hardcover of Icemark (yet). I just remember seeing one on the shelves of Fully Booked Cubao at the time that I bought my copy of Dean’s Tam Lin. It really is great that Scholastic had this dinner thing for book bloggers. I already started on the first Icemark book because it seemed like my kind of thing – epic fantasy. 🙂 I actually didn’t expect anything specific so I was just happy with what I got. I’ll be really interested to hear what you think of The Returning. I liked it a lot, but I could see a couple of different ways people might have problems with it, depending on their background and expectations. I’m worried that I might be disappointed because MWT and Marchetta are two of my favorite authors but since I’ve seen lukewarm reviews, I’ve lowered my expectations.